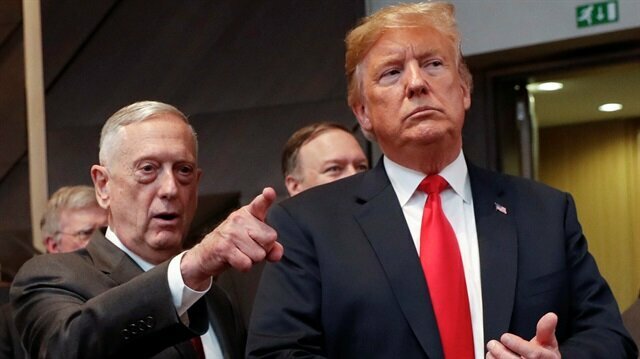 U.S. President Donald Trump walks in with U.S. Defense Secretary Jim Mattis. Long accused of protectionist tactics that make it a difficult place for foreign firms to operate, China is trying to reverse that narrative amid an escalating trade war with the United States, green-lighting huge investments and portraying itself as a champion of openness. But critics argue that despite its attempt to claim the moral high ground as U.S. President Donald Trump threatens to apply more tariffs on Chinese imports, Beijing's recent moves to make it easier for foreign businesses to set up operations also effectively acknowledges that it has had discriminatory market barriers. This week, China agreed to a $10 billion petrochemicals project by Germany's BASF that will be the first such plant in China that is wholly foreign-owned, not a joint venture. It also approved a huge new wholly-owned Shanghai factory for U.S. electric car maker Tesla Inc, and a $2.3 billion joint venture organic light-emitting diode (OLED) plant to be built by South Korea's LG Display Co Ltd. Responding to the Trump administration's latest plan to slap 10 percent tariffs on an extra $200 billion worth of Chinese imports, Assistant Commerce Minister Li Chenggang said on Wednesday that China would not close itself to U.S. business. "I want to stress that the Chinese government's attitude to support business cooperation between the two countries will not change, its determination to push forward reforms and improve the business environment will not change, and its stance of opposing unilateralism and supporting multilateralism will not change," Li said at a business forum in Beijing on Wednesday. “They go low, we go high," he said, in an apparent jab at Trump as he borrowed a phrase used by former U.S. First Lady Michelle Obama in the 2016 U.S. election campaign. Most U.S. businesses operating in China oppose the use of tariffs in retaliation for the challenges they face, from an uneven playing field to poor protection of intellectual property rights, a survey showed on Thursday.Almost 69 percent of the 434 respondents to the annual China Business Climate Survey of the American Chamber of Commerce in Shanghai opposed tariffs, while just 8.5 percent backed them, the body said. "Resolving these challenges in an equitable manner is essential for the United States and China to have a healthy long-term commercial relationship that brings benefits to both our peoples," it said in a statement on the survey results.Futures drop after US threatens more China tariffsKeep calm, don't inflame trade row with US: China to its state mediaThe survey, conducted between April 10 and May 10, reflects the mix of key concerns and realities for American businesses in China at a time of heightened uncertainty as the Trump administration raises the ante in its trade war with Beijing.U.S. President Donald Trump has accused China of unfair trade practices that give its firms an advantage, while hobbling American companies and creating an outsized trade deficit for the United States.On Tuesday, the office of the U.S. Trade Representative said it would impose 10 percent tariffs on an extra $200 billion worth of Chinese imports, from food products to tobacco, chemicals, coal, steel and aluminum.US readies $200 billion in additional Chinese tariffsThe survey showed that while U.S. companies continue to face challenges in China, 34 percent of respondents felt Chinese government policies toward foreign companies had improved, up from 28 percent last year.The number of companies that felt policies had worsened for foreign firms fell to 23 percent from 33 percent, although 60 percent of respondents felt China's regulatory environment lacked transparency, on par with last year.Insufficient intellectual property rights protection and the need to get licences were the top two regulatory challenges, although slightly fewer companies found both to be a hindrance in the 2018 poll, compared with that of 2017.To force greater market access, 42 percent of respondents favoured investment reciprocity, up from 40 percent last year. But the number opposing it also grew, to 16 percent, from 9 percent last year. The number of those unsure fell to 31 percent from 44 percent. "Despite the relative optimism our members feel guarded about the future," AmCham said in its statement.Concerns such as government favouritism for domestic firms and pressure on U.S. ones in strategically important sectors to transfer technology were "stoking demand for reciprocity in the U.S.-China trading relationship, even if our members generally oppose the use of retaliatory trade tariffs," it added.The biggest operational challenge of all was rising costs, an issue confronting more than 95 percent of respondents, the poll showed. More than 85 percent of respondents saw domestic competition as a challenge.The proportion of companies expecting to be profitable was basically flat, at about 77 percent, but firms signalled they were pulling back slightly on investment.The survey showed 53 percent of companies increased investment in 2017, down from 55 percent the year before, highlighting a trend of reduced investment growth since a 2012 peak, when 74 percent of respondents said they had boosted investment in China. The recent investment announcements came as Premier Li Keqiang this week visited Germany. The two countries signed commercial accords worth 20 billion euros ($23.5 billion), including the BASF agreement. Chinese state media framed such cooperation in the context of the increasingly bitter trade dispute with Washington. "The trade war should push China and the EU to cherish mutual cooperation, because this increasingly scarce cooperation is becoming more valuable," China's nationalist tabloid, the Global Times, said in an editorial on Wednesday. As the threats in the trade dispute have increased, so too have signals from Beijing that it means to follow through on reforms. Chinese officials insist there is no link, and that it will open up at its own pace. Rising costs are also frustrating to foreign manufacturers in China. Australia is preparing to ban Huawei Technologies Co Ltd from supplying equipment for its planned 5G broadband network after its intelligence agencies raised concerns that Beijing could force the Chinese telco to hand over sensitive data, two sources said.Western intelligence agencies have for years raised concerns about Huawei's ties to the Chinese government and the possibility that its equipment could be used for espionage. But there has never been any public evidence to support those suspicions.US experts raise concern over FETÖ threat in AmericaHuawei, the world's largest maker of telecommunications network gear and the No. 3 smartphone supplier, has promised that Canberra will have complete oversight of 5G network equipment, which could include base stations, towers and radio transmission equipment.That sort of oversight model has been accepted by other countries - notably the UK, where a special laboratory staffed with government intelligence officials reviews all Huawei products.Rise of robots fuels slavery threat for Asian factory workers: analystsOther Western countries, including New Zealand, Canada and Germany, also say they have sufficient safeguards for assuring that Huawei equipment does not contain "back doors" or other mechanisms for secretly monitoring or collecting information.But Australian intelligence agencies have told lawmakers that oversight will not allay their concerns, two political sources who have been briefed on the matter told Reuters. "It is a Chinese company, and under Communist law they have to work for their intelligence agencies if requested," said one of the government sources. "There aren't many other companies around the world that have their own political committees. "Both sources declined to be identified because they were not authorised to speak to the media.Huawei has already been mostly shut out of the giant U.S. market over national security concerns. Its business serving small, rural telecom operators is now at risk after new attacks on the company in recent weeks by some U.S. lawmakers.The move to ban Huawei in Australia comes as tensions mount over China’s growing power and ambitions in the region.Relations between the two countries are at an all-time low after Prime Minister Malcolm Turnbull last year accused Beijing of meddling in Canberra's affairs, and China responded by slowing some Australian imports.Australia's 5G service will require a dense network of towers that would then be leased to mobile providers such as Telstra Corp.Mobile carriers typically have access to sensitive personal information, such as internet search history or emails. But in Australia and most other countries, there are strict laws governing when and how they can do so.Australia's intelligence agencies fear that if mobile operators rely on Huawei's equipment, the Chinese company could develop a means of collecting data or even undermining the stability of the network. Chinese law requires organisations and citizens to support, assist and cooperate with intelligence work.Huawei Australia's chairman, John Lord, said that law does not apply to its operations outside of China. "That law has no legitimacy outside of China," Lord said. "Within that country, any information coming through us and any equipment we put into their national infrastructure is safe to the best of our ability, and it's secure. "AMERICAN INFLUENCEIn 2012, Australia banned Huawei from supplying equipment to the country's National Broadband Network, which has been hampered by technological failures.Australia believes that the 5G network, which will provide mobile internet speeds 50 to 100 times faster than current technology, will be the cornerstone for future innovations such as driverless cars. That makes it crucial to keep the network secure.Turnbull in February received briefings from the U.S. National Security Agency and Department of Homeland Security on the threat from Huawei, one source familiar with the meeting told Reuters. "The UK and New Zealand, they have decided that the risk of Huawei is worth it for the benefits of the network. For the Australian Security and Intelligence Organisation (ASIO) and the U.S., it is not worth the risk," a second political source said.AUSTRALIA-CHINA TENSIONSAlthough Australia's intelligence agencies are unwavering in their advice, Turnbull has yet to formally sign off on the Huawei ban.One of the sources familiar with the process said the government is "in no great rush to confirm the ban. ""It is going to highlight the anxiety that Australian lawmakers have about the rise of China, and it is not going to do any good for the Australian-China relationship," said Adam Ni, visiting fellow in the Strategic and Defence Studies Centre at the Australian National University.Despite the trade pressure, Turnbull can ill afford to overrule the country's security authorities amid a rise of Chinese hawks within Australia's government.In rare public testimony, Australian Security Intelligence Organisation director general Duncan Lewis this year warned that foreign espionage, interference or sabotage could inflict "catastrophic harm" on the nation's interests - remarks that were widely considered a thinly veiled reference to China.The warning spurred a backbench lawmaker, who sits on the country's important parliamentary Intelligence and Security Committee, on June 18 to urge Turnbull to reject Huawei, a source familiar with the details of the party-room meeting of the ruling government told Reuters.Turnbull did not directly address the comment, the source said, leaving his own party uncertain of his leanings.In legislation seen as aimed at China, Australia will soon require lobbyists to declare connections to foreign governments.Canberra has also called for increased international aid to the Pacific to counter what it says is Beijing's attempt to exert greater influence. In recent weeks, China has issued a shorter list of areas closed to foreign investment, and committed to easing or eliminating foreign equity caps in sectors that include banking, insurance, securities, the auto industry, as well as in shipbuilding and aerospace. But the string of announcements come at a time when there has been slowing foreign investment into China and more vociferous complaints about Beijing's market barriers and the difficulty of doing business in the world's second-largest economy. And Beijing is still holding up at least one major takeover involving foreign companies - U.S. chipmaker Qualcomm Inc's deal to buy Netherlands-based NXP Semiconductors NV . That has been waiting approval from China's antitrust regulator for months, leading to speculation among investors that the deal is being held hostage to the trade dispute with Washington. Years of lacklustre follow-through by China on its reform pledges has left what many in the foreign business community call "promise fatigue". Business leaders have been warning that if China didn't take real measures to address a lack of reciprocal market openness, it would sow retaliatory sentiment among its largest trading partners. And trade hardliners, particularly in the United States, had argued that Beijing would not make good on its pledges until other countries began imposing costs upon Beijing. European Union Chamber of Commerce in China President Mats Harborn on Tuesday called Trump's tariffs the "sledgehammer approach", but said the root cause of what China has termed the "largest-scale trade war" in economic history began in China. "The reason we are where we are is because the Chinese leadership did not proceed as quickly as we wanted as a trade community," Harborn told a news briefing. Some in the U.S. business community, while rueing the damage caused by Trump's tariffs, privately say Beijing's recent emphasis on accelerating reforms may not be a coincidence. "Tariffs are biting. The Chinese are less confident internally than externally. They have never been tested this way," a U.S. industry source told Reuters, asking to not be named given the sensitivity of the matter. Propaganda authorities have also issued unusually strict rules limiting local media coverage of the trade war because of worries that unrestrained reporting could set off panic and roil its already jittery financial markets, sources within Chinese state media have said. China is clearly angry about Washington's hard line on trade, but has controlled coverage of the row in its media, limiting open commentary and banning attacks on U.S. President Donald Trump, several sources with knowledge of the matter said.Beijing has issued unusually strict rules limiting coverage of the trade war because of worries that unrestrained reporting could spark instability or roil its already jittery financial markets, according to sources within Chinese state media. "When exposing and criticising American words and actions, be careful not to link it to Trump and instead to aim it at the U.S. government," said a memo based on a set of directives issued verbally by government officials that was circulated to reporters at a state-run news outlet and seen by Reuters.China says will hit back after US proposes fresh tariffs on $200 bln in goodsMedia outlets must help "stabilise the economy, growth, employment, stabilise foreign trade, investment, finance, stabilise the stock market, the foreign exchange market, the housing market, and basically stabilise the peoples' thinking, hearts and expectations", it said.A person who works at a leading Chinese news website said the rules issued last week were "the most strict yet".The website was told to post only stories about the trade conflict by state news agency Xinhua, rather than publishing its own. It was also ordered to keep the topic out of the top few headlines and closely manage comments about it, according to the source.US readies $200 billion in additional Chinese tariffsThe website's smartphone app was no longer permitted to send push notifications on the subject to users, and the website was forbidden from setting up special pages about the dispute.Like other Chinese media workers who spoke with Reuters for this story, the source declined to be identified by name due to the sensitivity of the topic and because he was not authorised to speak publicly about it.Editors at several leading state-media outlets, including the China Daily, the Global Times and Xinhua, were not made available after Reuters requested interviews. The information office of the State Council, or cabinet, did not immediately comment on the state's efforts to censor news of the trade row.It was not immediately known if Beijing's attitude would change after the United States threatened further import duties on Chinese goods on Tuesday in a sharp escalation of the conflict between the world's two biggest economies.To be sure, there have been vitriolic editorials in key Chinese newspapers as the trade tensions have simmered.In recent weeks, state media have criticised U.S. behaviour as reckless, hegemonic, delusional, and accused the Trump administration of harbouring "blood lust" and behaving like a "gang of hoodlums".REVEALING CARDSBut the attacks have been general - there has been little mention of Trump, for instance - and few details on how China will be affected.Two sources at separate state-run news organisations said they had been instructed not to mention the impact of the trade war on Chinese companies in their coverage.At one large state news organisation, a fourth source said journalists had been instructed to report on Chinese company news with caution because some were already feeling the effects of the trade spat.Reporters at the news outlet, a key government mouthpiece, were directed not to stir up negative emotions or "reveal the cards" of Chinese importers, the source said.In disputes with South Korea and Japan in recent years, Beijing has taken a more aggressive stance and at times encouraged public anger.In 2012, state media tacitly supported anti-Japan protests during a spat over disputed islands, and last year the Communist Youth League helped target South Korean brands on social media amid a row over Seoul's decision to allow the United States to install an advanced missile defence system on the Korean peninsula.But the power imbalance in the China-U.S. trade dispute and the potential for real economic discomfort have led the control-obsessed leadership to adopt a softer approach, analysts said. "They know the seriousness of the situation and the possible consequences, and they don't want the media coverage to bring any kind of extra damage," said Li Xigen, a professor in the department of Media and Communications at City University of Hong Kong. "Later, as the situation gets worse, if the people are actually affected with their jobs, with prices ... that may become real anger, and if the media do anything to stir up that kind of anger it will cause some kind of very bad consequences. "The trade war does not appear to be a hot item on China's tightly-controlled social media. Media sources said authorities were censoring anything found objectionable, minimising the prospect that any outcry on social media platforms could spur a backlash against U.S. brands.Wang Jiangyu, a trade expert at the National University of Singapore, said attacking U.S. firms could backfire. "China might need to restrict the market access of American companies. But to purge American companies that are already operating in China might be a very bad idea. Those companies generate jobs and revenue for China. Most Apple products are made in China," he said. "To do something to harm American firms that are already operating in China would be very stupid." And European officials have said Beijing is trying to woo the EU with market access in return for standing with China against Trump's trade measures, though the Europeans, who share U.S. criticism of China but disapprove of Trump's tariffs, have largely refrained from taking sides. "By committing themselves to further openness. I think China hopes it can minimize the departure out of China of multinational firms," said Louis Kuijs, Hong Kong-based head of Asia Economics at Oxford Economics.